Pace bowler Boyd Rankin has been ruled out of Ireland’s fixtures for the remainder of the season after suffering a fracture of his left tibia. The Bready man suffered the injury training with Warwickshire ahead of their ongoing Championship clash with Surrey. 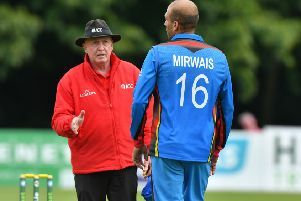 Subsequent scans revealed the fracture which will rule him out of Ireland’s KPC Group Series this week against Pakistan, the ICC InterContinental Cup and T20 matches against Hong Kong, as well as next month’s ODI’s against South Africa and Australia. Bracewell confirmed that Ireland will not seek a replacement for Rankin in the matches against Pakistan at Malahide.